SOUTH BEND, Ind. - A three-goal third period, including freshman forward Jack Jenkins' first career game winner, lifted the No. 8 Notre Dame hockey team to a 4-1 victory over Maine on Friday night at a sold out Compton Family Ice Arena (5,022). Thomas DiPauli scored early in the first period but Maine tied the score at 1-1 midway through the opening stanza. Maine goaltender Matt Morris kept it a tie game for the next 30 minutes, though the Irish owned the majority of puck possession and were heavily outshooting the Black Bears. "It was just one of those dangerous games," Notre Dame Head Coach Jeff Jackson said. "They defend real well, they're tough to get through the neutral zone and defensive zone. They bend but don't break so they're hard to play against." Midway through the third period, following a cycle play along the far boards with Sam Herr and Jake Evans, Jenkins notched his second goal of the season to eventually lift the Irish to the win. "(Jenkins) gives our team energy by the way he plays," Jackson added. "He's tenacious, and he's a hard kid to play against because he's a good on the fore-check. He leaves it all out on the ice, that's for sure." Mario Lucia netted a power-play goal just 1:29 after the Jenkins tally and then DiPauli added an empty net goal to seal the win. Petersen was once again steady in net for the Irish, stopping 21 of the 22 shots he faced, including several big saves early in the third period to keep it tied at 1-1. Morris totaled 39 saves on the night, including breakaway stops on DiPauli and Herr. Notre Dame finished 1-for-5 with the man advantage, while Maine was 0-for-2. Jenkins' goal was scored on a delayed penalty, but it was before Petersen could get to the bench in favor of the extra attacker. With the victory, Notre Dame improved to 17-5-7 on the season and to 13-2-2 in Hockey East play. Elsewhere, Boston College defeated Merrimack, 6-3, so the Irish and Eagles remained tied for first in the league standings after Friday night's action. "We're definitely in playoff mode," Dipauli said after the game. "Going to Vermont, that was like a playoff series: tough building to play in, tough team. We're just taking it game by game. Right now, tomorrow night is the biggest game of the season for Hockey East and the NCAA standings." The Irish and Black Bears close out their weekend Series tomorrow night (Feb. 13) at the Compton Family Ice Arena (7:10 p.m.) in a game that will also be televised by the NBC Sports Network. 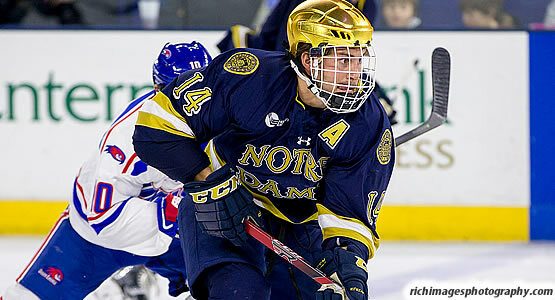 -- Notre Dame took a 1-0 lead on Thomas DiPauli's 11th goal of the season, scored at 4:08 of the first period. After Connor Hurley and Mario Lucia combined to keep the puck down low, DiPauli gained possession, swung around the net and took a wrist shot that Morris got a piece of but couldn't keep out. -- Maine's Andrew Tegeler made it a 1-1 game at 8:05 of the first when he split the Irish defense and slid the puck low past Petersen. Daniel Perez's pass from the defensive zone sprung Tegeler for the chance, while Mark Hamilton also assisted on the play. -- At 9:38 of the third, Jack Jenkins restored the Irish lead, 2-1, with his second goal of the season. He took a Jake Evans feed and fired the puck through Morris' legs, while Sam Herr also assisted on the play. -- Just 1:29 later, Mario Lucia scored the 20th power-play goal of his career to give the Irish a 3-1 cushion. He knocked in a loose puck at the back post after Morris turned aside back-to-back shots by Anders Bjork and DiPauli, who earned the assists on the play. -- DiPauli closed out the scoring when he took possession of a rebound following a wide shot by Maine and skated through the neutral and offensive zones before depositing it into the empty net.